Catholic Google is a quick attempt to capture a niche audience using Google's custom search. It markets itself as the search engines that good Catholics should use. 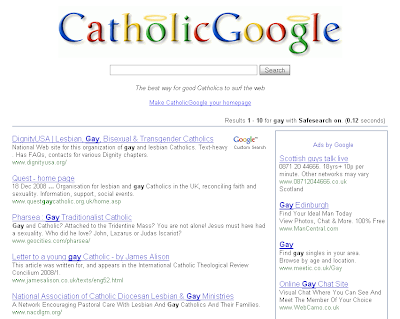 It was all to tempting to see which results the catholic search engine returned for [gay]. Perhaps it would recommend sites about being happy? No. In truth there seems to have been effort put into the selection of the source sites for the engine. The organic search results are clearly ones appropriate to a religious of faith important search. It's the paid search results, where Catholic Google has less influence, which produce the results that hard line catholics would be less happy with. On my test searches the top 5 PPC results where always gay dating or gay chat sites. In some cases the PPC results included ads to retailers like Play.com or Amazon with creatives about videos and "gay".